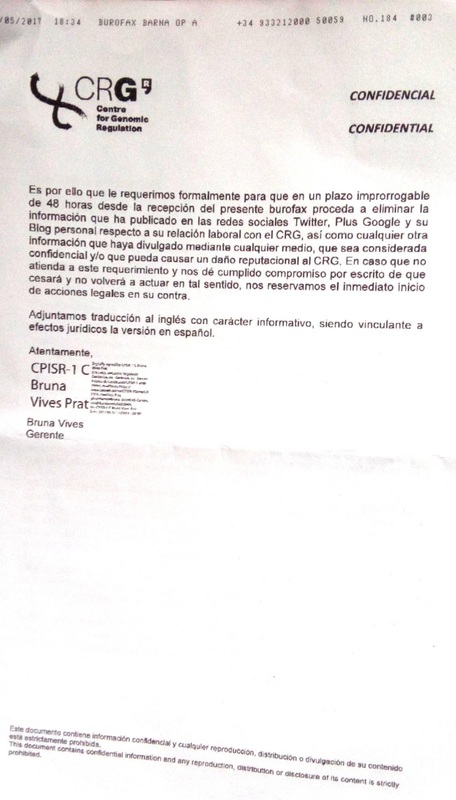 Here are the threats of legal persecution I've got from CRG, Barcelona, signed by Managing Director Bruna Vives on behalf of the Centre and Luis Serrano, CRG Director. Look at the Centre for Genomic Regulation at their finest in intimidating and disrespect. My notes are below the copies (clickable to enlarge). Here we have a classical actus reus. 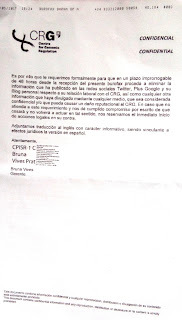 This threatening from CRG, Barcelona under the claim to keep «professional secrecy» (are these people even sane?) and «confidentiality», i.e. the claim to keep silence about their excellence in research misconduct, followed by these threats where I'm named as «and / or» doing even something «criminal», — look like fit of anger unless just laughable. They are supposed to represent a Spanish intellectual elite, aren't they? 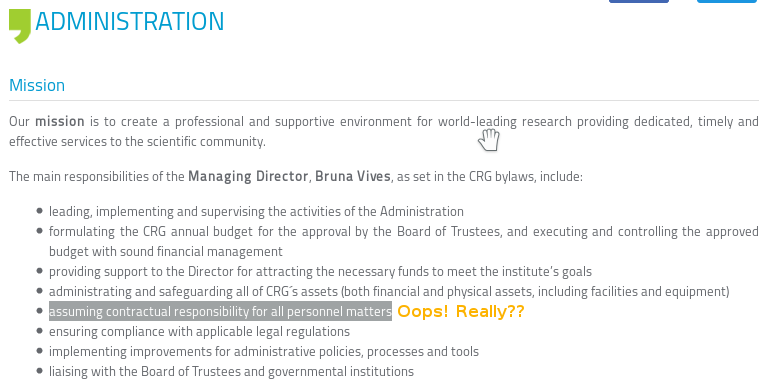 Solely this claim to keep their threats confidential (see also the bottom of the pages) should be enough to launch the investigation on the activity of the top employees of CRG, including here-below mentioned favorite of Luis Serrano, CRG Director (ah, all right… she's supposed to be on the top anyway…). NDA (appendix to the work contract) I signed, concerned the contract in force or expired. I was slandered and mobbed by this M Lluch-Senar, CRG staff scientist (intensively supported by her patron, Luis Serrano, CRG Director in whatever she's been saying about me) several times, she announced me that I'd be dismissed anyway the very next day after she was set as my boss by Luis Serrano. Luis Serrano was persistently coercing me, in written too, to talk only alone with his favorite (who by the way is craving for a PI position and her henpecked one is desperate to help her). 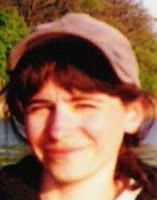 I called for CRG's Conflict Resolution Committee, which has completely ignored my complains and followed Luis Serrano's non-negotiable instructions forcing me to recognize scientific authority of his favorite, who persistently lied about my personality, aggressively refusing to get or accept any technical reasoning out of her competence. Moreover. She was misleading me with data sources and urging me to work with erroneous data concocted by herself. I was given «24 hours» to confirm my response. I was fired by the end of the same week. 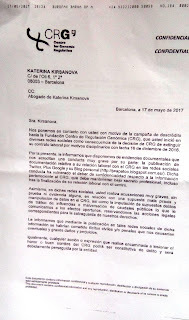 CRG was already clearly told off about the neglect of their duty and reputation — they have completely disrespected the words of the conciliation officer, they have even refused to present themselves directly on the hearing. They had given no care to their reputation then and now suddenly they have recalled and decided to take care about it, starting with threats, apparently from the bottom of their hearts and their notion of what the (academic) culture is. Surely they don't just perform only a bare money laundering using their positions in Spanish science. Now they claim that one of their former, thrown out on the streets, employee is damaging their «honour» or «reputation» even «with the intention». If it's possible for you to put a word «or» between «honour» and «reputation» which you claim you have (after you have lied so dishonourably) — then, obviously, only an upper authority could explain you something about what honour and reputation are: it seems you're still uncertain about these entities. No wonder you have failed to keep them intact. You did it on your own. No one has forced you to behave like you have. Paraphrasing Bertolt Brecht («Vertrauen wird dadurch erschöpft, daß es in Anspruch genommen wird»), your honour and reputation begin to vanish the very moment you claim you have them damaged the way you do it, — especially after you were utterly unable to display at least a minimum respect to your employee, let alone the kind of integrity you have shown as pertinent to you. My story is just a shadow on the sand in the background of your behaviour and culture. I'm too small comparing to your own self-exposure. «We trust that your knowledge, skills and experience will be among our most valuable assets» — remember the text of your offer? — you gave no respect to any of thus enumerated (by your own) qualities. That's why the only point you could use to attack me with your misconduct was a «discipline». Which is ridiculous since you do not have any notion of what it is. Not to mention work ethics. I don't damage your «honour or reputation» as you claim «with the intention». I speak out, that's it. And of course I would only greet an independent open investigation of your professional activity and of its compliance with your own Code of Good Scientific Practice. Even then I doubt that it could depreciate your significance and self-worth acquired with such diligence by your so creative advertising of your excellence, with your passionate appeal for money throughout your much more conspicuous networking, connections, pulls and of course… well… social network accounts. Just don't stop disseminate food & drinks for your subscribers and sponsors as you used to do it: to make sure they would love your excellent science. And, Bruna, seriously… I am so sorry, but having known now the story of your appointment, this your threatening burofax speech looks like a sincere coming out, especially when it's read in Spanish. But of course, of course, it's not how it looks like. 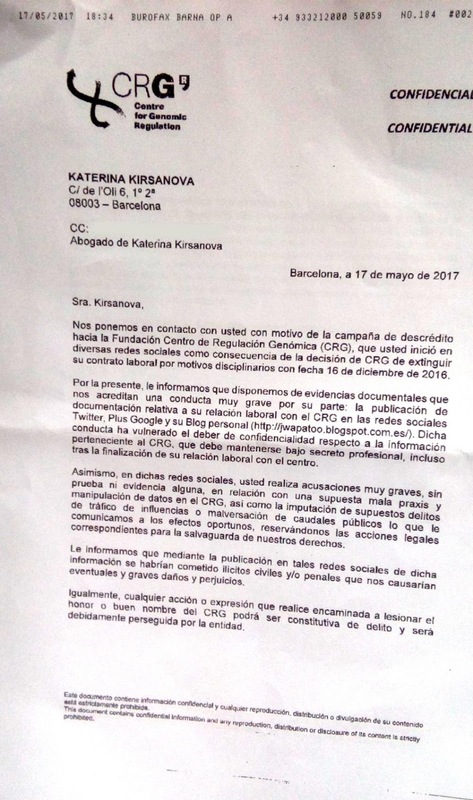 All the corresponding docs on CRG/Barcelona's research misconduct, mobbing and lies are on GitHub or DropBox.